Based on the novel by William Gay, “The Long Home” is set in the 1940s in rural Tennessee, where a young man (Hutcherson) goes to work building a honkytonk for a charismatic and diabolical bootlegger, unaware that the man had murdered his father 10 years prior. He runs into further trouble when he falls for the young woman the bootlegger is grooming to be a prostitute. Franco is also expected to star, and will produce alongside Rabbit Bandini’s Vince Jolivette and Jay Davis. Robert Halmi Jr. and Jim Reeve are exec producing. Franco previously cast Hutcherson in another directorial effort, “In Dubious Battle,” based on the John Steinbeck novel. A release date for that film has yet to be announced. Hutcherson can be seen next in “The Hunger Games: Mockingjay — Part 2,” which bows in November. He is repped by CAA, The Beddingfield Company and Hansen, Jacobson, Teller, Hoberman, Newman, Warren, Richman, Rush & Kaller. The 2014 Teen Choice Awards air this evening, and Josh is expected to hit the stage live at the Shrine Auditorium in Los Angeles as one of the presenters. The 2014 TCA’s will air TONIGHT, August 10 @ 8PM ET/PT on Fox. Don’t miss it! Kicking off the 6th Annual Nike Basketball 3ON3 Tournament Presented by NBC4 at L.A. LIVE, Josh Hutcherson will host the 3rd annual Josh Hutcherson Celebrity Basketball Game Benefiting Straight But Not Narrow (SBNN), an ally organization that prepares and trains young adults on how to become allies of their LGBTQ peers. Hosted by Josh Hutcherson (The Hunger Games, Catching Fire), celebrity participants scheduled to appear include: Terrell Owens (Former NFL Star), Clark Gregg (The Avengers), Kyle Massey (That’s So Raven), Sasha Vujacic (Professional Basketball Player), Romeo Miller (Rapper/Actor), Josh Henderson (Desperate Housewives, Dallas), Karrueche Tran (Host/Model), Arlen Escarpeta (Into The Storm, Whitney Houston Biopic), Cisco Adler (Musician), Christopher Minzt-Plasse (Super Bad), Frankie Delgado (Actor), Jarod Einsohn (Project X, Eagle Eye), Greg Finley (Actor), B.J. Britt (Transfer, Peaceful Warrior), Hayley Orrantia (Goldbergs), Bracin Skywalker (Top Track & Field Athletes in the Nation), Ben Lyons (Entertainment Reporter), Manny Streetz (KIIS-FM), Landry Bender (Sitter) Ryan Riess (Professional Poker Player), Chris Brochu (Actor/Singer), Darrell Atkins (Dutch Hollow), Wes Chatham (In the Valley of Elah) and others. Talent for the Josh Hutcherson Celebrity Basketball Game has been booked by 10 Fold Entertainment. It all takes place at Nokia Plaza L.A. LIVE, 777 Chick Hearn Ct. in Los Angeles, CA 90015 on Friday, August 8, 2014 at 7 p.m.
Josh is among the 271 artists and executives who have been invited to join the Academy of Motion Picture Arts and Sciences, meaning he could contribute to next year’s Academy Awards balloting. Actors Ben Foster, Sally Hawkins, Michael Fassbender, Julia Louis-Dreyfus, Mads Mikkelsen, Lupita Nyong’o and Jason Statham and directors Gavin O’Connor, Paolo Sorrentino and Jean-Marc Vallee are also on the membership list with Hollywood’s top casting directors, cinematographers, costume designers, make-up artists, animators, producers, moguls and documentary makers. New members will be welcomed into the Academy at an invitation-only reception in September. According to the list of guests published on the 2014 MTV Movie Awards website, Josh is going to be in attendance, and he is going to be seated right next to his ‘Catching Fire’ co-star Sam Claflin (see photo below). 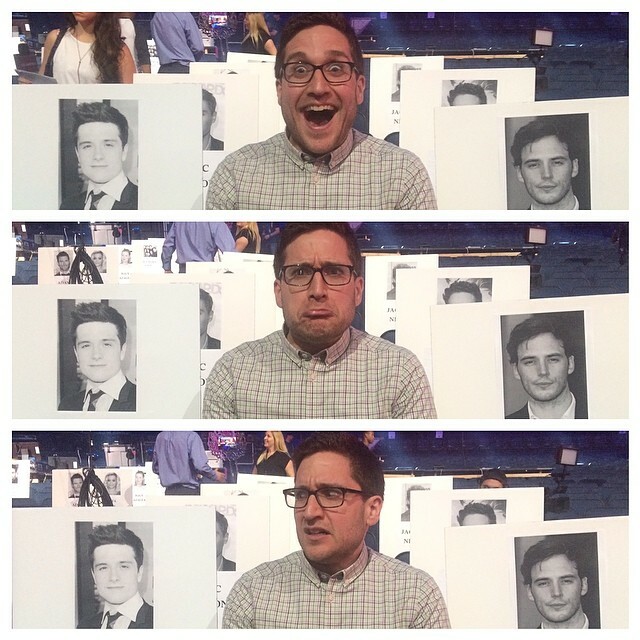 There is a good chance we’ll also be seeing him on stage since there are tons of Catching Fire-related nominations! Don’t miss the award ceremony this Sunday, April 13th at 9/8c!